I'm super psyched to share with you all that Max of Max's Best Bootcamp and Local Food Rocks have joined forces in the kitchen. As part of Max's local TV show we'll be bringing you a Recipe of the Week segment. For our first video together Max challenged me to come up with a recipe for folks interested in reducing carbs/starchy foods from their diet. I knew right away that good ol' cauliflower was the answer. Cauliflower is so much more than just that crunchy white stuff on a typical vegetable platter! 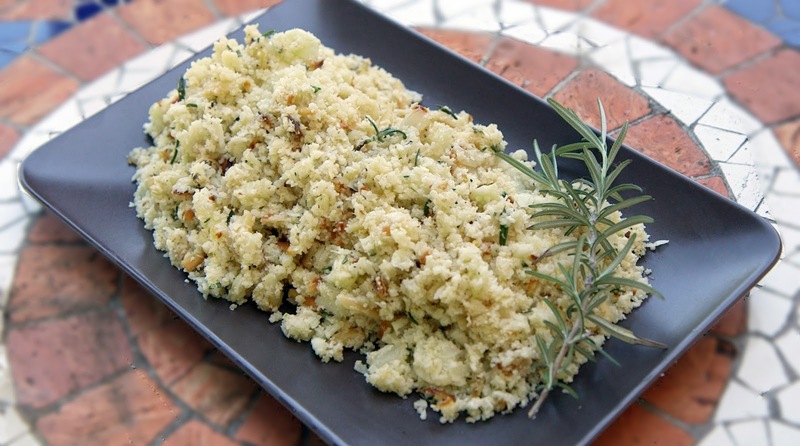 Our easy, quick recipe for cauliflower pilaf is a great starting point. Is it going to taste exactly like rice, well, no; but it tastes great and helps get more vegetables into your diet. Use this recipe as a base and then get creative and add in whatever you want from bacon pieces to dried cranberries. Be sure to visit Max's Best Bootcamp TV to catch the full episode. It's full of fitness inspiration. Wash the cauliflower head and thoroughly dry. Remove the florets. In small batches, add the florets to the food processor and pulse them until reduced to the size of rice or couscous. Set aside. In a large sauté pan heat the coconut oil over medium high heat. Add the garlic and almond slivers. Once the garlic becomes fragrant and slightly golden. Add in the cauliflower “rice”. Cover and cook for 5-10 minutes until the “rice” is softened. Stir in the fresh rosemary. Season with salt and pepper. Like Max always says, "Eat Clean. Train Dirty." Looks delicious. Adding this to my list of recipes to try.